What exactly is Hoshin Kanri? What are the benefits of using it? How to implement Hoshin Kanri? Find the answers here. What are your goals for this month? What are your goals for this quarter? And for this year? You do have goals that you have agreed on with your manager, don’t you? Or if you are the CEO, you must have set goals for your VPs, haven’t you? If your work is guided by a set of well-defined and well-communicated goals, you might have been exposed to the Lean Management tool called Hoshin Kanri without even realizing it. The words "hoshin" and "kanri" mean direction and administration, respectively. Used together, they bring the meaning of “How do we manage our direction” or “How do we make sure we go the right way”. Hoshin Kanri is an essential Lean management method for ensuring that the strategy of a company gets executed across the hierarchy. The leadership of the company develops a strong vision answering the question “Why does the company exist?”. The leadership team defines key objectives or also a mission. If achieved, they will create a competitive edge for the company. These are major objectives usually requiring the effort of every single person in the company, not monthly or quarterly objectives. The leadership team, along with the senior management, breaks down the objectives into annual goals. Once the annual goals are crafted, they need to be “deployed” across all levels of the organization. This is the process of “goal setting” which starts at the top and is propagated to each employee. With the next step, the real execution starts. This step goes hand in hand with the next two. The monthly reviews make sure that the plan is being executed according to the plan. At the end of the year, there is an annual review, which validates the end result that has been achieved. As shown in the image above, the Hoshin Kanri planning is not only a top-down approach. It has built-in continuous improvement mechanisms, which are a key element to making the method successful. These are the Catchball and PDCA tools. A crucial detail about the Hoshin Planning is that it is not executed strictly top-down. On the contrary, it is a joint effort between a manager and a subordinate who have to mutually agree on the optimal set of goals. If management directs people into achieving certain goals, without collecting feedback first, they risk demotivation and costly errors, should some details happen to be missed. The benefit of discussing the goals with the people who will be actively working on them is that they will think through the details much more thoroughly compared to the management. Practically speaking, this is the essence of the Catchball. Having well-communicated, realistic and agreed-upon goals is important, because it enables ownership and motivation, creates a valuable feedback loop and improves the commitment to the execution process. ACT: if successful, standardize the experiment results and restart the sequence. Achieving continuous improvement is only possible if you make PDCA a continuous effort. If you try it a few times, PDCA is likely to generate improvements, but unless you iterate constantly, it is going to be of less value. It is important to execute the experiments in a (somewhat) controlled environment. If the results of the experiment do not lead to meaningful results, the experiment is of no value, as the results cannot be treated as the baseline of a future PDCA cycle. When running PDCA experiments, always pursue the system optimum and not the local optimum. Local optimums might be dangerous on the system level because they can lead to excessive levels of work in progress (WIP). It has never been easier to start a business and reach a seven-digit revenue. However, it has never been harder, in the history of mankind, to make people care about your products. There is severe competition in every market and only the smartest and the most dedicated survive. That is why companies need to make sure they have a well-thought-out strategy and can execute relentlessly. It is not about having a strategy or execution. It is about both! Additionally, alignment is among the greatest challenges of the big enterprise, where thousands of people do thousands of jobs every day. It is often a challenge even for smaller companies, where work is much more dynamic and the big picture can easily be lost. When Hoshin Kanri is implemented effectively, it forces the leadership team to come up with a vision and a list of breakthrough goals, creates a cascade of complementary goals, which ensures alignment, and provides the necessary leverage for successful execution. In other words, Hoshin Kanri bridges the gap between strategy and execution by creating alignment and focus. How to Implement Hoshin Kanri? Mapping everything on such a spreadsheet is definitely going to help you during the planning process. However, there is not much help as far as the actual execution goes. One of the methods for Hoshin Kanri execution, that has been successfully tested and validated, is Portfolio Kanban. When the CEO and the leadership team come up with the vision and the breakthrough goals, they work with the Program Level to define the programs that will deliver on these goals (they play the Catchball). On the next level, the program management layer works with the project layer to define the necessary projects to deliver on the goals of the program (again Catchball). The process continues until all levels in the hierarchy have clearly defined goals. Then, the execution starts. 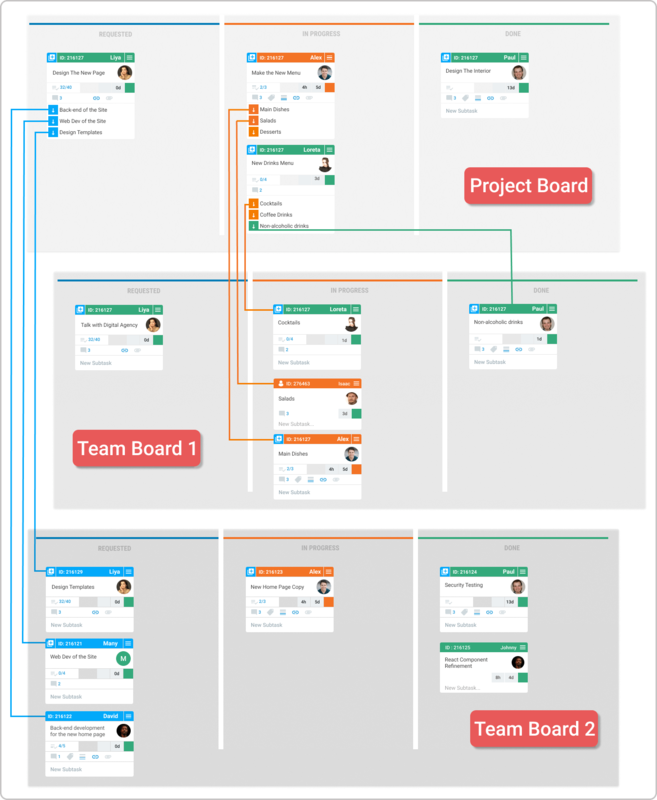 With software like Kanbanize, you can represent all the goals and the related work items with Kanban cards on team or management (Portfolio Kanban) boards. The benefit of the software is that it makes it visible when work items and goals get completed. This saves hundreds of hours for status meetings and eliminates the possibility of human error and reporting bias. The automated way of status reporting makes the monthly reviews easy and data-driven. When a digital system collects all metrics automatically, the PDCA cycle is much easier to implement and besides, you can do it retroactively. In other words, you could just go back in time and analyze past events, as if they were happening today. Even greater addition to this approach is the ability to forecast on the Portfolio Kanban level. When the data is in place you can use sophisticated Monte Carlo simulations that project how much work you can accomplish by a given date. With this information in place, you can speed up the annual reviews and, in fact, make them monthly. This will create a much faster flow of information upwards, allowing the leadership team to take corrective actions, should they need to. The only disadvantage to the Hoshin Kanri is the fact that nobody can predict what would happen in a year. As a matter of fact, this annual goal setting has been widely rejected by the agile community and this is no wonder. Each company is like the human body – the departments and the teams represent the organs and the information represents the blood that nourishes these organs. If it takes a year for the blood to reach the organs, then the body will die. The blood circulation needs to be regular and stable in order for the body to be healthy The same holds true with information. While the big goals and vision must exist, for an organization to be successful, there needs to be a system in place that adapts it to the dynamic world of today. One of the possible solutions is Portfolio Kanban. 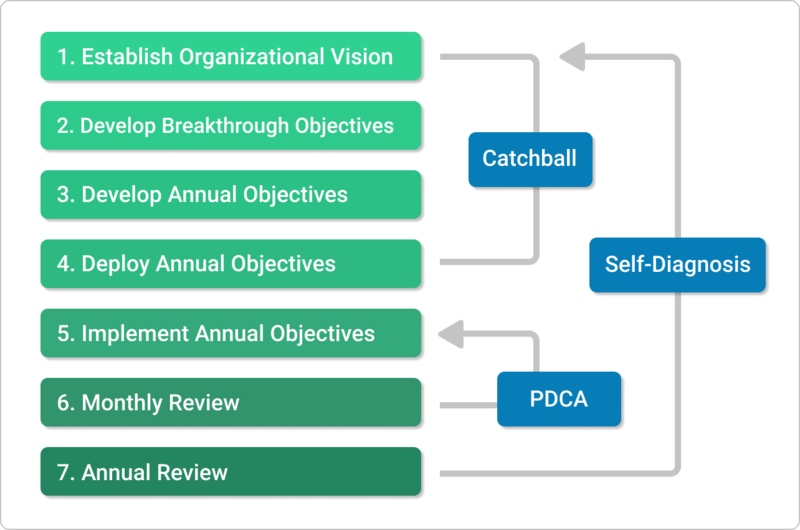 An integral part of Hoshin Kanri is the pursuit of continuous improvement via tools such as PDCA and Catchball. Portfolio Kanban can help with the implementation of the Hoshin Kanri planning and the actual execution of the goals. Hoshin Kanri must be adapted to the dynamic world of today by shortening the communication cycles and creating a more fluid way of information sharing.